The products I ordered came exactly as they said they would. I would order again..... BUT-- I was able to speak with their service tech person and he was able to inform me how to fine tune their collator and it REALLY helped eliminate some of the feeding issues of my projos!!! Now I have some back up parts-- which are always good to have--- but my problems weren't the parts I ordered it was the placement of my bullet feeder and angle of the spring feed tube!! The company is VERY HELPFUL and willing to help!! 5 stars in my opinion!!! Item packaging on web site is not stated. I needed 6 balls, got 18. Paid 3 times what was necessary. Double-Alpha reply - you do not seem to have purchased the product directly from us. 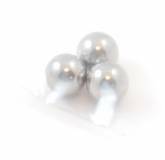 Our website clearly states that this is a set of 3 ball bearing replacement. 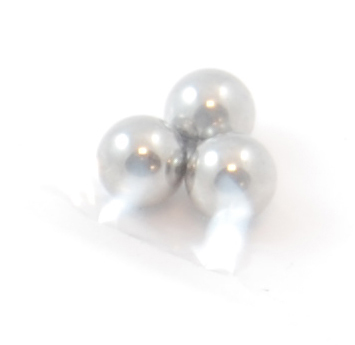 \"A replacement set of three steel ball bearings for your bullet dropper die.\"
Je ne sais pas si ces pièces peuvent casser dans l'outil mais au cas où il vaut mieux en avoir en plus vu le prix. Ersatzteil ( Kugeln für Mr.Bulletfeeder )schnell geliefert Preis. Que dire? Indispensable en cas de perte à toujours avoir dans un tiroir.